Countless Business Analysts have turned to BPMInstitute.org to earn one of seven certificates. Review recommended reading for business analysts and then review each business analyst training course in the BPM Certificate below. What Skills are Needed for BPM Success? Empower yourself with the disciplines and methodologies you need to transform your organization into an agile enterprise. You have the flexibility to take training at a face-to-face event, select an on-demand course, attend live online, bring training to your location with customized in-house training. Take a single course to enhance your skills, become a BPMPSM by earning your BPM Certificate or certify your knowledge by becoming a Certified BPMPSM with our BPM Certification. 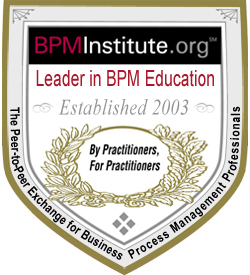 BPM 101 is the foundational course for those starting their BPM journey. It presents an overview of process modeling, analysis, design and the technologies in BPM. BPM 101 is especially useful for people new to BPM. It provides an overview of BPM as both a management discipline and as a set of enabling technologies and it establishes the foundation for the BPM courses that follow. Achieving success with BPM relies upon skill in process modeling, analysis and design. This course equips you with the practical, applied knowledge to lead/facilitate process improvement projects. Modeling, analysis and design skills are indispensable to BPM success. In this course you will acquire a solid understanding and develop skill in practical techniques for process modeling, analysis and design. This session presents key concepts and tools on process measurement. You will learn how to apply these principles in your organization at both the organizational level and the business process level. Process measurement skills are essential to BPM success. In this course you will acquire a solid understanding of practical measurement techniques and how to apply these to the analysis and design of business processes. Attendees will learn a structured approach to using BPMN. Their knowledge is enhanced by using a software tool to provide hands-on practice. The Business Process Modeling Notation (BPMN) is a standard for business process modeling, and provides a graphical notation for specifying business processes in a Business Process Diagram (BPD). It is based on flowcharting techniques similar to activity diagrams from the Unified Modeling Language (UML). Understand the similarities and differences between four seminal methodologies: Six Sigma, Lean, Reengineering and BPM. Do exercises for techniques and discuss cases in each methodology. This course provides an overview of various methodologies and approaches commonly used in process improvement and management. Participants will understand the similarities and differences between Six Sigma, Lean, Reengineering and BPM. Exercises and case studies are used to reinforce the guiding principles and frameworks for each of the four methodologies. Face-to-face and virtual facilitation skills are needed for developing a business architecture, creating a process model, leading an improvement team, or running a meeting. Learn models and practice in all these areas. Whether you are developing a business architecture, creating a process model, leading an improvement team, or running a meeting, great facilitation skills are crucial. You need to be able to keep people engaged, elicit the necessary information, create shared understanding and build consensus all while keeping them focused on the intended goal. Not an easy task. Organizational change management (OCM) is needed for success with business improvement and transformational programs. This exercise based course provides insight on OCM and reorganization, technological change and process based change initiatives. It has been said that “change is the only constant.” Yet, many business improvement and transformation programs fail to deliver their expected business results.